I have started this letter a thousand times in my head in the last week. 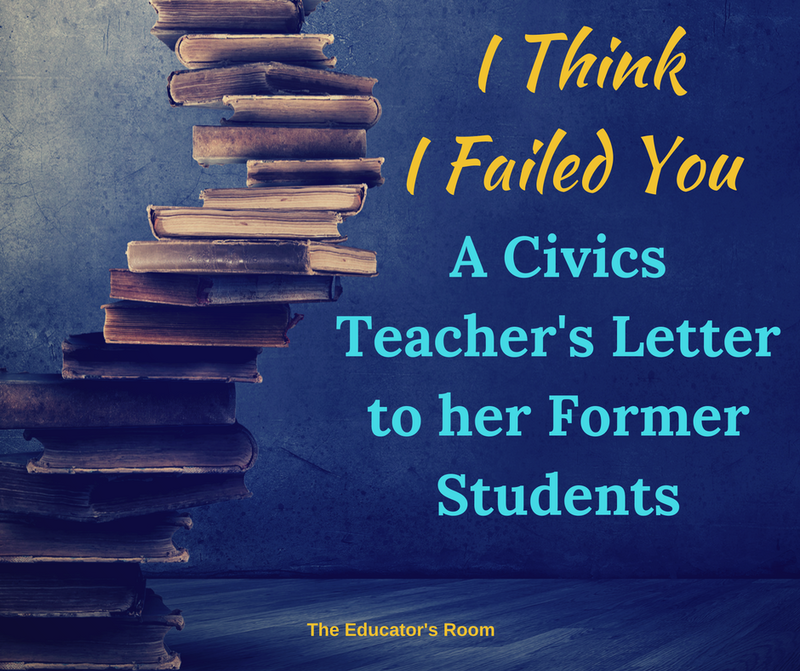 It’s hard to get past the first line: I fear I may have failed you as your Civics teacher. You have probably known me for many years as the one person in your life with unfailing trust in the power of democracy. My unwavering belief in what Dr. King taught us about the long arc of the universe bending toward justice. My devotion to the principles and institutions that have grown and progressed to include protections of the very people they once oppressed. But one of you reminded me recently that our challenge in the coming years is to be as genuine as we can be, and in that spirit of genuine reflection, I don’t think I can downplay the terrifying specter that is before us. It makes me wonder if I failed to see the signs and prepare you adequately for what we face in this new government. And for that, I am sorry. I taught you about Checks and Balances. It is enshrined in the Articles of the Constitution. No matter if a despot is elected to the Presidency, or if the same party controls both the House and the Senate, I said. There will always be a different branch to check that power. It is set up that way! But we are now entering an era where the same party will be the power in all three branches (with a vacancy still to be filled on the Supreme Court by that party), along with 33 state legislatures (which is only 2 short of having a Constitutional Amendment majority). If the incoming president has extreme conflicts of personal enrichment with his own global company being run by his own children (who are also responsible for staffing his Executive Branch) who will check that power? His own party decided that his own words, which revealed him to be a sexual predator, and the 12 women who came forward to verify that behavior, was not enough to keep them from making him their leader. So what action or behavior would induce them to use their Check power? The leader of his party’s electoral committee is now appointed as Chief of Staff to the president on equal footing with an avowed white supremacist as his primary advisor. So the party in charge of the Legislative and Executive Branches, and most of the states, has gone all-in with the agenda of white nationalism. It appears there is the possibility that Checks and Balances can fail us, and I should have warned you more clearly that it could happen, and that we should be prepared for that. I taught you about the Electoral College. Even at the time we had critical conversations about what purpose it serves, its imbalanced favoritism, the reason it was developed (hint: slavery). We studied the Election of 2000 and at the time, it was an anomaly that had only happened twice before, both times in the 1800s. But less than 20 years later, it’s already happened again. In fact (as one of you reminded me this week), in your lifetimes (in fact, in the last quarter of a century), John Kerry remains the only Democratic candidate that has lost the popular vote in a presidential election. In this 2016 Election, only 57% of eligible voters voted. Of that 57%, about 47% voted for the now incoming President. So if the voting populace in the United States were 100 people, about 30 of them chose the next president for all of them. We should have talked more about the impact of the Electoral College, how to work for stronger universal protections of voting, and not losing vigilance about how elections work. I taught you about the 14th Amendment. We spent a lot of time discussing the idea of Equal Protection and Due Process. The Rule of Law took prominence in our discussions of limits on government, and we talked extensively about the expansion of Executive Powers. The incoming president has vowed to deport immigrants by the millions, to stage raids on homes, businesses, churches, and mosques. Those of you who are Dreamers may have (or know people who have) trustingly given the government your information under the DACA protections, and now you wonder how that information might be used against you and your families. The 14th Amendment (or any of the other Amendments) seems to no longer apply, and you are scared. And so am I. I did not have the imagination to warn you that this could happen, and for that I am sorry. I also taught you that the institutions of American government were strong, that the systems were put in place to prevent tyranny, and that the entire point of the American Experiment was that we based our idea of government on a combination of a social contract, popular sovereignty, rule of law, and a living Constitution that can grow and change to reflect the expansion of liberty. I should have taught more vigilance about the fact that though the potential for these institutions is endless, they also could fall victim to their own roots in the stain of slavery and racism. Systemic racism and institutionalized discrimination and misogyny in our culture can only be dismantled by enough individuals willing to do the hard, consistent work of dismantling them. And key to this, it is not the job of the oppressed groups to do that hard work, it is the job of those have never felt the pain of that systemic corruption. I am sorry that I did not say this enough. As millennials, you became adults during the administration of a President who was raised in a way so familiar to many of you, who looked like so many of you or your friends, and who showed you how to have grace under pressure and deal with tragedy upon tragedy. No, we didn’t agree with every decision he made, but he was a President that made you believe that maybe that whole “moving forward” thing might be possible. I believed it. And now he will hand over the White House to the very man who spent five years using racist dog whistles to publicly demean the President and question his legitimacy, not only as a President, but as an American. In other years, this might just be a normal handing over from one party to another in a national election. But the president-elect has spent the last 15 months publicly promising to specifically harm many of you and your families, to remove many of our rights and our protections, and to sever our ties with our allies. The election of a president should not create terror or fear in entire groups of people – especially young people. The election of a president should not embolden people to commit hate crimes. The election of a president should not cause people to wonder if they can trust their neighbors not to harm them. That’s just a start, I know we will come up with more as we learn. I tried to teach you to think critically, and from what I can tell, you do. I’m proud of that. It’s that thinking, and it’s your decisions and actions going forward that will matter. I’m sorry I didn’t prepare you better. I hope I didn’t fail you. I still believe Democracy is the best idea ever, and I still believe the possibilities for expanding liberty are limitless, but I also still believe it’s up to us to make that happen. Let’s not fail each other in this. This is such a ridiculous comment or even a statement to make towards students. This proves that our system is not rigged or that our system still does work after 227 years. As President Obama stated this week, “the people have spoken, just as they did in 2008”. One would have failed one’s students if and only if one didn’t teach the concepts of our democracy. This is stating that you failed because Hillary lost or because Trump won. This is absurd.